TPU writes Corsair is about to introduce the Obsidian 350D, a new Micro-ATX case that should be released later this month or early May. The case measures 450mm x 210mm x 440mm, it's made from steel and has a brushed aluminium front panel with two 5.25" drive bays, two USB 3.0 ports and HD audio jacks.. Pricing will be around $100 for the regular model and $110 for a windowed version. 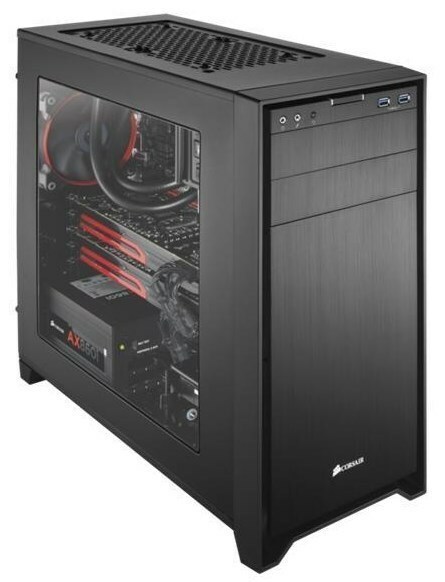 Internally, the Obsidian 350D doesn't feature any drive cages that can go on to obstruct long graphics cards. Instead, it features two 3.5-inch bays towards its bottom, and what appear to be three 2.5-inch bays towards the top portion, with a gap in between. Ventilation includes two 140 mm fan vents on the top, to which radiators can be latched on to (one 140 mm spinner included), and a rear 120 mm fan (included).